WS2811 IC Chip, Addressable Color, need for controller. 1) The package does not include any power supply or controller. You'll need a WS2811 controller to use them. 2) The work voltage of the LED string must be 12V DC. Otherwise, it will be burnt out. INDIVIDUAL ADDRESSABLE: Each LED can have its own color and brightness. 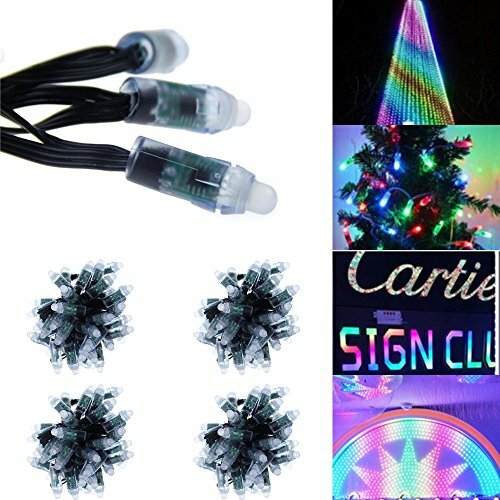 You can control each LED individually and set it to any color or animation you want. INDIVIDUAL CUTTABLE: Each pixel can be cut off without damaging the rest pixels. So you can shorten or extend the distance between two pixels if you want. IP68 WATERPROOF. Weatherproof silicone wraps every LED pixel, protects it very well and makes it easy to clean. You can put them outdoor, even underwater. If you have any questions about this product by Alarmpore, contact us by completing and submitting the form below. If you are looking for a specif part number, please include it with your message.